Historically, geologic mapping has involved the generation of 2D maps depicting the distribution of geologic units at land surface. While there is a wide variation in what kind of units individual maps show, the standard is still the production of a map sheet, or a 2D layer of information. With the computerization of geology about 25 years ago, there has been a continual push to expand what can be done with computer technology. Geographic information systems (GIS) are also about 25 years old and have brought sophisticated capabilities for creating and managing 2D geospatial map information. While recent years have seen the development of high-resolution 3D visualization within GIS applications, these packages still work primarily with 2D spatial data types. GIS applications largely haven’t evolved into tools for creating and managing complex 3D geospatial data. Other software applications have filled this need in various ways to a limited extent, but a package called GeoVisionary offers new capabilities that push the boundaries to new levels. The Illinois State Geological Survey (ISGS), a division of the Institute of Natural Resource Sustainability (INRS) at the University of Illinois, employs approximately 170 people over a range of geologic disciplines. 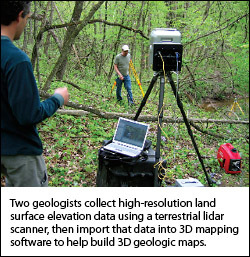 Over 10 years ago, the Survey resolved to expand its detailed geological mapping program with a goal of developing a fully computerized, 3D mapping program. While this decision was based on a vision of where geologic mapping could go with a better integration of computer technology, significant changes were needed to reach this goal. We initially assumed we could rely on existing software to meet our needs for various parts of our mapping workflow. While this was the case for initial 3D mapping pilot studies, the existing software choices were limiting and could not meet all of our long-term needs at an institutional level. To overcome the problems of inefficiency that developed from our reliance on a patchwork of software packages, we conducted a thorough review of our process and the software options. From the process review, we defined the major components of our new 3D geologic mapping workflow: data management, 2D surface interpolation, 2D map construction, 3D geologic map construction, 3D visualization, and 2D/3D map-product production. In our developing internal jargon, 3D maps were what others called 3D models, the digital representation of geologic deposits within some 3D cube of the earth. The 2D/3D map products were what we created by bundling select parts of the 3D map and provided to customers for their use in various decision-making areas. From our review of available software, we found that software packages we were already using could address our needs with data management, 2D surface interpolation, and 2D map construction. We found and evaluated several 3D mapping and visualization applications to see if they could provide the quality, flexibility, and scalability that our program demands. While there were several applications that seemed to fit this bill, on further evaluation none of them really met our needs. Geologic mapping and research in geological surveys typically involves interpreting and defining the regional framework of geologic units and doing this over scales that range from the individual outcrop to thousands of square miles. This type of work requires geologists to explore different interpretations on the origin and correlation of surficial and subsurface deposits. In addition, geologists work with a wide range of different kinds of data (e.g., outcrop descriptions, water well drillers logs, stratigraphic borings, geophysical borehole logs, etc.). Software that accommodates all of these types of information and allows exploration of these “what if” scenarios was seen as critical to our mapping program. Geological surveys also often work through a region over a period of many years, usually producing a suite of different map products. To accommodate this, we required software that could efficiently handle large 3D data sets. Finally, during our evaluation and discussions we realized that we need mapping and visualization software that is relatively intuitive and could be learned and used easily by the geologists for whom this software was a primary tool for viewing data and making maps. Through our evaluation, we found that software targeted to environmental consultants is often designed to work in the relatively shallow subsurface, to work on desktop workstations running Microsoft Windows, and to be priced usually much less than $100,000 per license. Software targeted to oil and gas development or mining-resource development typically is designed to work in the deep subsurface and is therefore designed to work on computer systems ranging from beefy desktop systems to larger UNIX workstations. Because they are designed for deep subsurface, these software packages often do not work easily on surficial or near-surface geologic mapping projects. In addition, these packages often cost much more than $100,000 per license. We found several applications that integrated 3D mapping and visualization. The visualization portions of the software were inevitably linked to the overall data structure and mapping options. This often made visualization of the 3D maps very cumbersome to anyone who isn’t a specialist on the software. Many of these mapping and visualization applications were designed to create geologic maps that were linked directly to a fluid-flow simulation software. This generally made the overall software design even more cumbersome. We found that several software applications depended heavily on loading all of the data into RAM. This typically worked well for small map areas but made work on large map areas impractical or impossible. We found that some of the PC systems performed fairly well on 3D mapping but the visualization capability was limited. Higher-end systems did a better job on rendering quality, in general, but either they only dealt with a limited number of data types or were too expensive to be viable in our environment. We also evaluated the costs and benefits of developing our own visualization software or building off one of the open-source platforms that exist, such as GeoWall. As a result of this evaluation, we decided to apply a software solution that is modular, focusing on the use of targeted software to accomplish specific parts of the mapping workflow, rather than looking for an integrated software application that could handle most of the workflow elements. We built a customized Microsoft Access database to test and enable new ideas in data management for mapping projects. We found that a new application, GSI3D, was particularly well suited to developing 3D geologic maps using a very traditional workflow and tools that incorporated basic geologic insight and methods. GSI3D was programmed in Java, however, so it is unable to manage large land-surface elevation models from compiled lidar data sets, aerial photography, or the tens of thousands of water well driller’s logs that we often use in our larger mapping projects. We found we still needed a robust package for high-resolution 3D rendering that could accommodate the wide range of earth-science data types and very large file sizes that we were dealing with. Our initial solution to the 3D visualization software was to begin custom program development within ESRI’s ArcGIS environment. ArcMap and ArcScene are applications that allowed us to import many of our existing data and create custom scripts for interacting with the data in 3D space. Within this environment, we were able to create high-resolution images that included borehole log interpretations, subsurface geologic surfaces, seismic and resistivity profiles, geophysical borehole logs, cross sections, surficial geologic maps, etc. However, we quickly ran into problems owing to the wide range of spatial scales at which we work. ArcScene provides a high-quality rendering of these data, but like other applications, it loads all of the information into RAM and couldn’t manage spatially large projects at manageable speeds. We also found that ArcScene was unable to render lidar data in high-resolution, significantly degrading the features that are contained in these data. We liked the ability to extend the program through custom scripts, but we were stuck by our inability to bring in entire mapping projects for viewing, analysis and interpretation. In discussions about 3D mapping software with colleagues at the British Geological Survey (BGS), we learned about a new visualization application on which they were collaborating with the developer, virtual reality (VR) specialists Virtalis. The BGS had come to similar conclusions on the problems with 3D geologic visualization software and had decided to solve the problem by collaborating with Virtalis, its existing vendor of 3D stereo immersive display systems, to develop a visualization package that could meet all of these needs. GeoVisionary was developed initially to allow high-resolution visualization of the kinds of spatial data that are generally used in geologic mapping projects, including lidar elevation models and high-resolution aerial photography and satellite imagery. One of the design goals for GeoVisionary was to ensure that data sets for large regions, national to sub-continental, could be managed without loading everything into RAM and while allowing real-time interaction with the data. Virtalis’ 20 years of expertise in VR and handling large engineering CAD datasets made that goal possible. GeoVisionary provides high-resolution 3D and 3D stereo visualization that is limited only by the resolution of the data. It is highly scalable and is able to provide “fly-through” viewing of mid-continent-scale data sets in real-time at full speed. It is primarily a visualization software package, but it does have some data interactivity built in, such as terrain-measuring features. It also allows for digitization in 3D space, allowing geologists to digitize geologic contacts directly on the 3D elevation and orthophotography. The preliminary mapping capability will save much time and improve the agreement of resultant geologic lines with the topographic base that is used for mapping. In addition, BGS developed linkages between GeoVisionary and ArcGIS, allowing for dynamic updating between the two software packages. Lines digitized in GeoVisionary can be immediately saved as shapefiles in ArcGIS. This linkage will allow us to continue to use our custom ArcGIS programs that we have been developing for the past year, ensuring that we’ll be up and running quickly with this new environment. In addition, Virtalis has added an Application Programming Interface (API), which will allow us to begin developing new customizations directly within GeoVisionary. From discussions with colleagues at the BGS and Virtalis, we realized GeoVisionary would address all of our major goals for a 3D visualization program. BGS geologists were emphatic in the value that the stereo visualization brought to improving the efficiency and accuracy of geologic mapping. In evaluating our options with Virtalis, we decided to invest heavily in GeoVisionary. We have begun using GeoVisionary as our main 3D and stereo visualization software for our high-resolution mapping workflow. We have also made GeoVisionary a foundation application within our new INRS Earth Systems Visualization Laboratory. This lab is designed to work across earth-science domains, and the rendering capabilities of GeoVisionary, together with other tools (e.g. ArcGIS, Mathematica, Imagine), allow us to meet that growing need. In addition to the initial order of five floating licenses, the ISGS has installed a 14’ x 8’ screen in a new high-resolution ActiveWorks VR suite from Virtalis. GeoVisionary allows us to pull disparate mapping data together under one high-resolution 3D visualization environment, it integrates dynamically with a suite of custom tools we’ve already developed for use with ArcGIS, and it works with logistical and data management solutions already in place. With GeoVisionary and the opening of the INRS Earth Systems Visualization Laboratory on the University of Illinois campus, we are able to provide a host of high-resolution visualization and analysis solutions to a range of earth-science research applications. Donald A. Keefer is director of the Geologic Mapping and Hydrogeology Center at Illinois State Geological Survey, Institute of Natural Resource Sustainability, University of Illinois.